The px2-300d comes in diskless and three diskful versions with two 1 TB, 2 TB and 3 TB enterprise-class drives loaded. 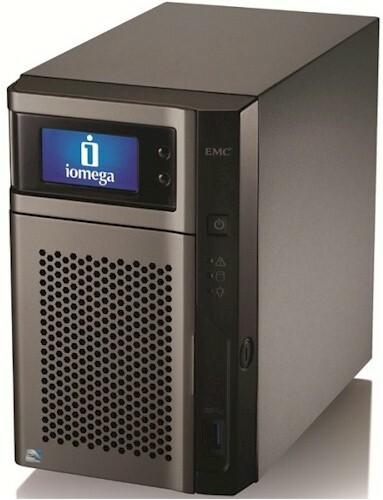 Iomega sent the 4 TB version (Iomega Item number 36057) for review. The NAS is taller than most other two-bay products I've recently reviewed. This is partly due to the front panel LCD display that isn't found on competing products. Too bad Iomega didn't include a buzzer too for audible alerts. As the photo below shows, two hot-swappable drives mount in unlockable trays. I can't ding Iomega on the px2 for leaving the drives completely unprotected as they did on the px6-300d. Note the front door lock on the photo below. Like the px6, the drive trays have mounting holes for 2.5" drives. Only Iomega SSD's SKUs are found in the approved drive list main page. But if you follow the links on the Qualified Disks tab of that page, you'll find this FAQ that lists five Intel SSD 520 series drives. Also listed are a dozen or so 3.5" SATA 1, 2 and 3 TB drives. There are no 4 TB drives listed as of this writing, however. Sorry for the fuzzy photos below, but that's all I found in the User manual. The single USB 3.0 port is found on the front panel, which can be good or bad, depending on your attached-drive backup strategy. The rear panel view below reveals the surprising addition of a VGA console port. I was able to get a login prompt from the console port when I attached a display and keyboard. But Iomega wouldn't cough up login credentials. The user manual says the port is "for video surveillance applications" and Iomega told me that it's also for "internal debug". Note also the removable card slot cover that is not called out. More on that shortly. Other ports are the same as on the px6 and include dual Gigabit Ethernet and two USB 2.0 ports. The dual LAN ports support jumbo frames with 4000 and 9000 Byte settings and can be set for adaptive load balancing, failover or 802.3ad aggregation modes.